Yesterday, Deadline: Hollywood announced that Bob Kushell, co-creator and showrunner for The Muppets, would be leaving the fledgling show while Bill Prady and a new showrunner (possibly Kristin Newman) would work on retooling the ABC series that has garnered vast quantities of media and social media coverage. I am part of that ratings drop, for reasons I will discuss shortly, but I have several friends and associates within the puppetry community who have struggled mightily to stem the tide, lauding the show’s freshness and energy and chastising its critics. I feel bad that I have let these people down, but I feel it is for good reason. 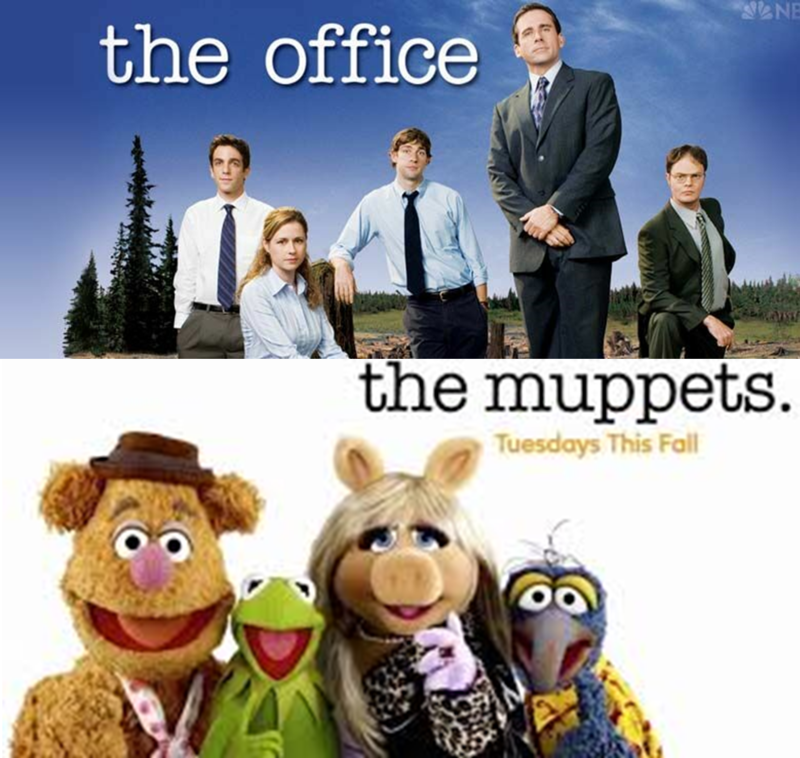 Briefly stated: The Muppets (the TV series) is a pale, anemic shadow of the Muppets (the icons). My biggest concern about The Muppets is that the Muppets aren’t leading the way…they are following someone else’s formula. This feels like total anathema to all of what Jim Henson was. The current incarnation is little more than The Office but with felt-fleshed characters. Look no further than the show’s logo which is presented in the same manner as that of The Office and with an almost identical typeface. And the setting within a late-night talk show makes it a pale imitation of The Larry Sanders Show. Case in point: References by members of Dr. Teeth and the Electric Mayhem to illicit drugs and rehab have become much more overt in the new series whereas they were only really implied previously. It is as though the showrunners don’t have faith in the audience “getting” the jokes. “Oh, my God! Did Floyd say rehab? That’s edgy.” No. No, it’s not. But back to the leadership discussion. Henson and his gang were innovators. They took an ancient format—the puppet show—and brought it to heights never before imagined. They didn’t pander to their audience but rather challenged them to follow along or be left behind. 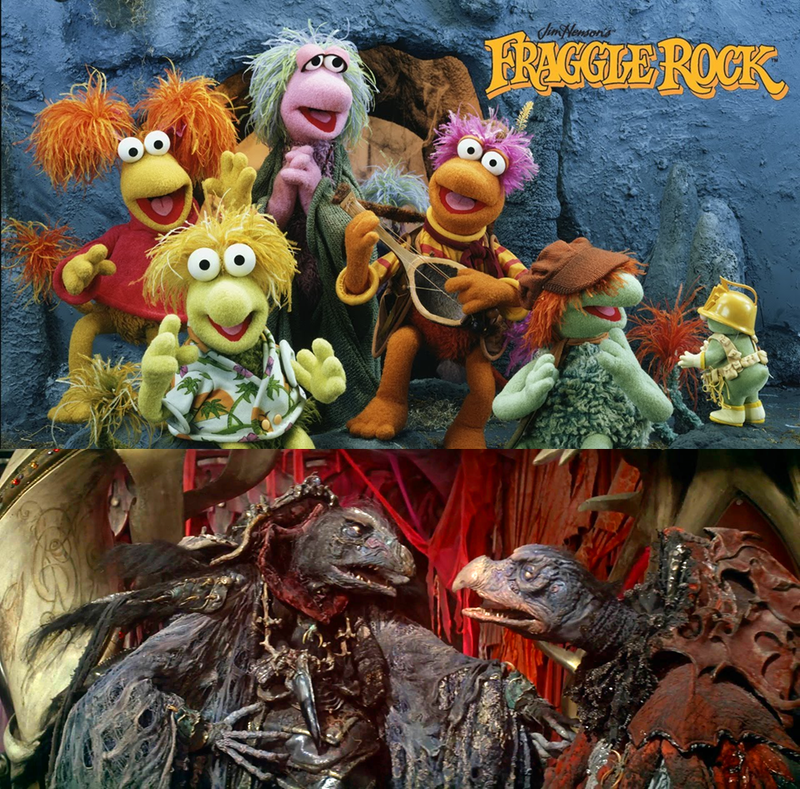 Sometimes that became wildly popular: The Muppet Show, Fraggle Rock. Sometimes it never found a wide audience: The Dark Crystal, Muppets Tonight. And, as I understand it, even the now idolized The Muppet Show almost never existed for lack of interest by American networks that couldn’t see the vision and felt variety shows were on their way out—in 1976, only The Carol Burnett Show remained, Sonny & Cher and Tony Orlando & Dawn having ended a year earlier. That’s why the show was created in the U.K. under the financial benevolence of Lew Grade. From a mechanical perspective, the artists working on The Muppets are doing an admirable job. These are incredibly skilled men and women performing a technically challenging art form that combines the illusory world of puppets and the frailties of human flesh. But all that skill and effort is for naught without a heart and soul. And these, in my opinion, are what the current show is lacking. Ironically, when I watch The Muppets, all I see are puppets, characters trying to entertain an audience. I don’t sense the humanity within the puppets, and it was that humanity that made the Muppets so special in the first place. Perhaps this is just a case of old-man-itis on my part—“when I was a boy…”—but sadly, I am putting down the empty toys that The Muppets represent and mourn the (hopefully temporary) loss of old friends—the Muppets. I wish everyone the best of luck with the reboot. PS I love the work of Bob Kushell and Bill Prady, and place no specific criticism on anyone’s shoulders for my concerns about The Muppets. Not saying this is the case here, but sometimes talent and creativity is not enough to overcome a bad match between artist and vehicle. Although I think the writer (Melissa Henson) has made some valid arguments about the writing of The Muppets, I think her overarching belief that this was intended as family viewing is wrong. Although these are beloved characters from film and television, this show was very much centred on an adult audience. To repeat an earlier point, calling this family entertainment would be to ascribe the same to The Office. As some of you know who’ve watched this space, I am fixated on puppets and improv and so, several months back, I started a social media campaign to bring Puppet Up! uncensored to Toronto. For the uninitiated, I recommend you click the link to see what this show is all about. Briefly, however, it is the Jim Henson Company taking their puppetry genius and applying it to a largely improvised comedy show designed for adults. Well, shortly after starting my campaign, the Henson Company announced the show was coming to Toronto. While I realistically have to believe the wheels were in motion long before I started whining on Facebook and Twitter, I will happily claim responsibly for them coming. 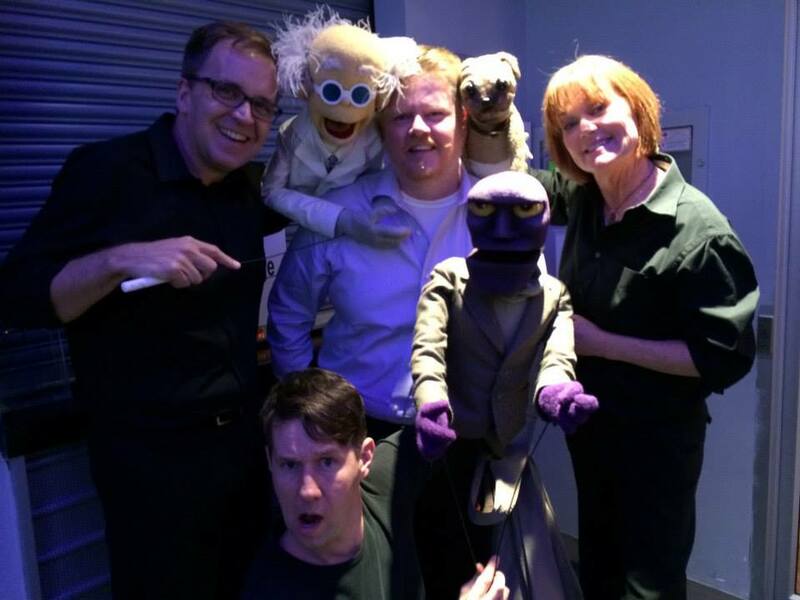 In the weeks leading up to the show, like a 15-year-old girl at a Bieber concert, I followed everything PuppetUp! on TV and online. I tweeted with the show organizers on an almost daily basis, and then when one of the puppeteers (Grant Baciocco) made the mistake of letting the world know he was in rehearsals, the stalking began. My first show was opening night (October 22) and within seconds of the lights going down, my mind was completely blown! This was everything I imagined and then some. It was everything I had in me not to run down from the balcony, up the aisle and onto the stage, grabbing a puppet as I passed the wall of hollow bodies. As one, the audience laughed, cringed, oohed and ahhed at the antics that both sent up and paid noble tribute to the late Jim Henson. But then, dear god, I found out that you could have your picture taken with some of the puppets after the show…I am proud to say I did not swoon (on the outside). Opening night was going to have to hold me for another week as 7 hours after the lights came up, I was in a cab, heading to the airport and a week-long date with the Austin Film Festival. The conference was great but I positively bounced at the idea that when I got home, I had two more shows to see…the final weekend matinees. 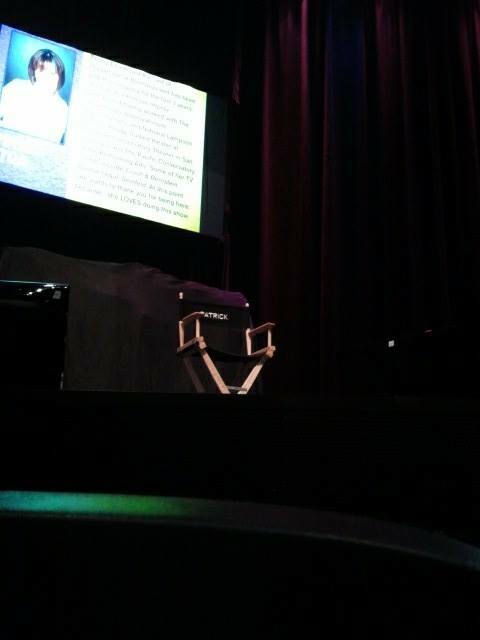 On Saturday (Nov 2), there I was, second row, stage left…effectively at the feet of show co-creator and host Patrick Bristow. Rather than have to squint at the puppeteers and watch the big screens, I now had close up access to the puppeteers, who became more fascinating than what was happening onscreen, to me. The show was great, although a few of the bits in the first act failed…which made them even funnier. 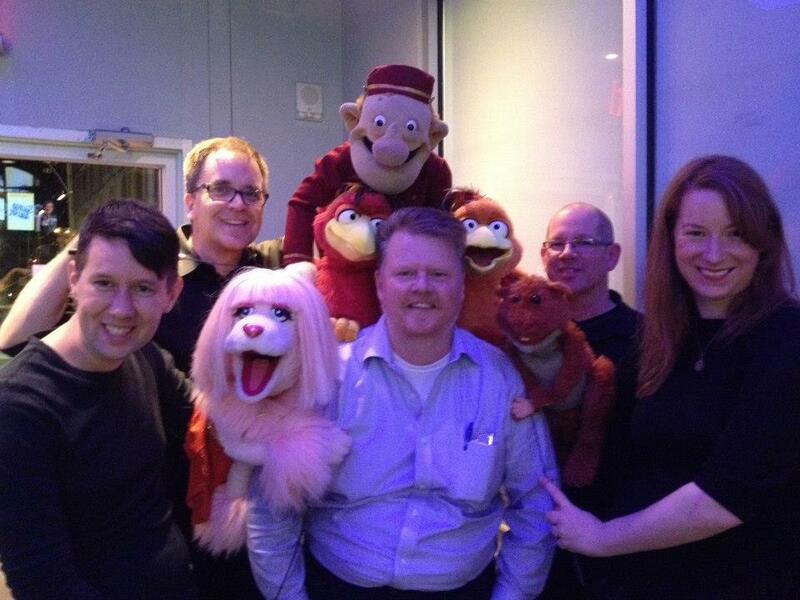 It was in that show that I truly fell in love with the talent of puppeteer Colleen Smith. WOW! And it was after that show that I finally got to meet Grant Baciocco, who was as charming and affable while wielding a camera as he was on Twitter. My love and enthusiasm for this show was so big that I decided there and then that I had to buy tickets for the final show and I had to bring two friends along for me even though it would mean going out of pocket. I was so tickled, I had to share this with people. Texting madly to check my friends’ availability and enthusiasm, I then popped open my laptop and purchased the best available tickets for the Sunday, 8 pm show for all three of us. Then came the show on Sunday (Nov 3). Again, sitting at Patrick Bristow’s feet. Shouting suggestions left, right and centre. Feeling like we were developing a bond, even though I knew he probably couldn’t see more than two feet into the audience. Nary a flaw in this show. The musical numbers popped. The classics practically brought tears. Colleen and Grant were amazing. Brian Clark, Peggy Etra, Michael Oosterom and Ted Michaels were on fire. And I got to add Michael to my photographic portfolio of puppeteers. 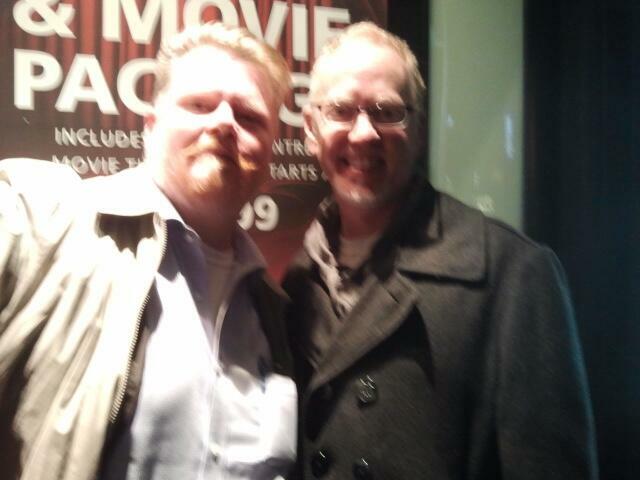 To make the afternoon even more special, as I waited in line at a nearby restaurant to grab dinner between the 4pm and 8pm shows, who should walk in behind me other than Patrick Bristow. 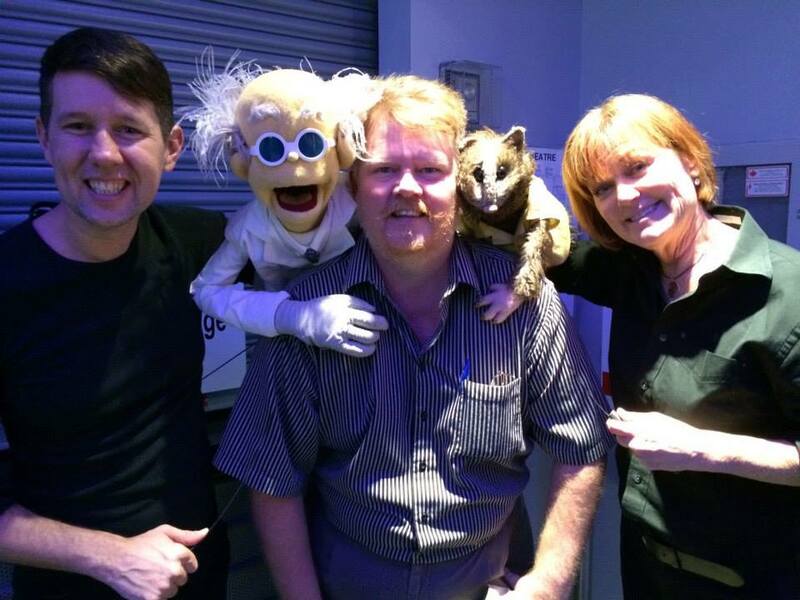 Still needing a picture with two of the puppeteers, I couldn’t die quite yet, but I was getting close. Patrick was wonderful and charming and was nice enough to pose for a photo. So here we are. Eight pm on Sunday night. I met Leela in the foyer of the theatre and left the ticket at Will Call for my friend, Michael. If I vibrated any faster, I might have been able to pass through walls. I was going to get to share this with two really important people in my life. 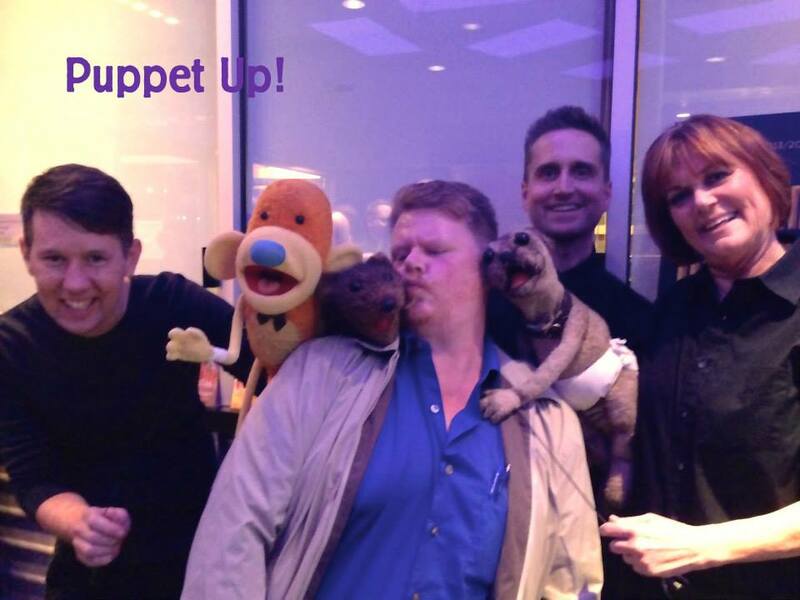 This was my birthday gift to me…sharing PuppetUp! There were a couple bumpy bits in the first part of the show, but it was still amazing. And the closing half was A-FIRKIN-MAZING! Every bit went perfectly. Even from the balcony, Patrick would take my suggestions (I was in the balcony, not Patrick). Leela, who is a tough comedic audience, laughed raucously throughout the show (high praise if any of the PuppetUp! people are reading this). Leela and Michael were both great to hang back with me…I wanted to be one of the last people to get my photo done tonight so I could let everyone know how much I appreciated their performances and talents. And beauty of beauty, the entire cast was out for photos on the last night. I was going to complete the set of puppeteers for the photo. Finale photo with (L to R) Brian D Clark, Michael Oosterom, Ted Michaels, Colleen Smith. Buried is Peggy Etra, and Grant Baciocco is on camera duty. As I was waiting for my turn, Patrick passed through the lobby and asked me to hang back. Interesting. After having my picture done and convincing my friend Michael to get his done, Patrick came out from a back room and handed me a puppet from the concession stand as thanks for all the support and enthusiasm I offered them while they were in Toronto. Nice! 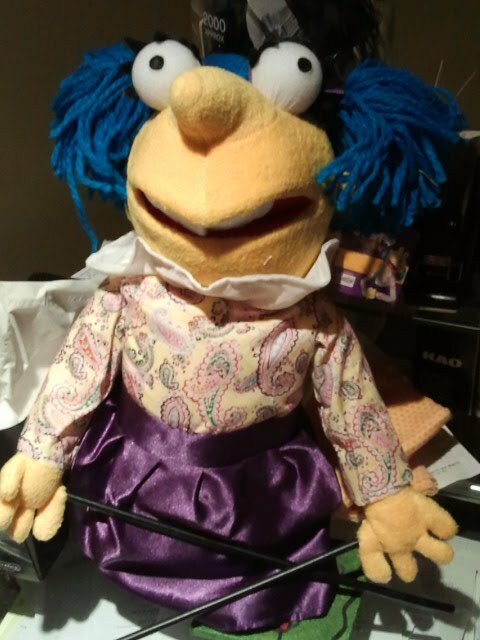 She (the puppet is a girl) is sitting on my desk as I type this. The new lady in my life thanks to Patrick Bristow and the folks at PuppetUp! I was able to shake everyone’s hand and let them know how much I enjoyed knowing them. I am currently hooking up with many of the puppeteers on Twitter and Facebook. And have promised them all that I will initiate the next social media campaign to get them to come back to Toronto. Based on their experiences in Toronto, both in the theatre and on the town, I think they’d be open to the idea. 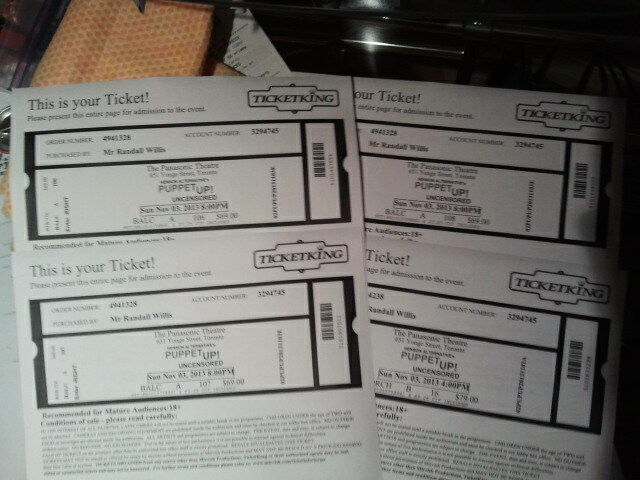 And now, sadly, PuppetUp! has left Toronto, but not without leaving an incredibly big mark on my heart. Thanks, folks. It was a special couple of weeks.